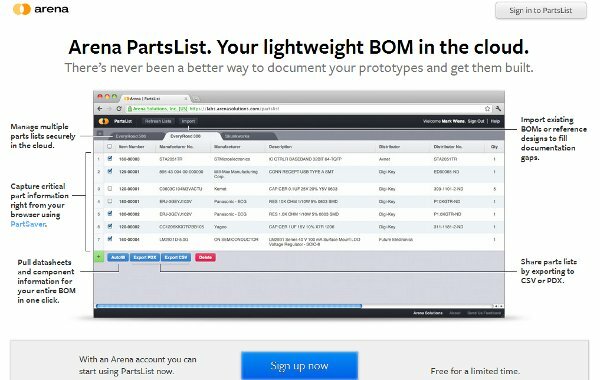 Octopart just tweeted a free tool for BOM management. You can import a CSV file into a project and auto fill details using Octopart. Their main tool is a more comprehensive product with collaboration features and stuff. They charge $79 per user per month, which includes training, tech support, upgrades, etc. This entry was posted on Wednesday, February 1st, 2012 at 11:00 pm	and is filed under documentation, partlist. You can follow any responses to this entry through the RSS 2.0 feed. You can skip to the end and leave a response. Pinging is currently not allowed. @Arthur Wow. When I posted it their website said free for a limited time. Oh well. Alright, what does “BOM” stand for? I only know it as byte-order mark and Google’s results don’t make the answer immediately obvious. Bill Of Materials. Basically a list of parts. Well, this would be interesting if they had a cheaper version for hobbyists. I can’t justify spending $9 a month and 90 days free doesn’t really get me anything: I’ll just put in the effort to get hooked. They might want to follow the path led by CADsoft Eagle — make a free/cheap version for non-professional use. I’d pay up to $25 a year for a tool like that. That’s wonderful Eric. It would help out the Hobbyists for sure. Any limitations in the free version? Nope, you can use the full functionality, and we do not plan to impose any limitation.